Most holy Apostle, St. Jude, faithful servant and friend of Jesus, the Church honors and invokes you universally, as the patron of difficult cases, of things almost despaired of, Pray for me, I am so helpless and alone. - and that I may praise God with you and all the saints forever. I promise, O Blessed St. Jude, to be ever mindful of this great favor granted me by God and to always honor you as my special and powerful patron, and to gratefully encourage devotion to you. St Jude you have never failed me in the past please hear and answer my prayer and interceed on my behalf and I will be eternally greatful. Amen. May the Most Sacred Heart of Jesus be adored, and loved in all the tabernacles until the end of time. Amen. St. Jude pray for us and hear our prayers. Amen. 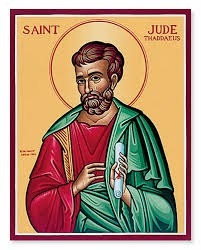 Blessed be St. Jude Thaddeus, in all the world and for all Eternity. I just found out that my mother is heading out shortly to have a followup ultrasound on her thyroid and a mammogram done today. Praying that her thyroid nodules are all benign and that they haven't increased in size or multiplied. Also, praying that everything will be okay with her mammogram. Thanking you for having answered past prayers and asking for your help to intercede on my behalf regarding my prayers. Thank you St. Jude! One of my mother's test results came back negative! Hoping for the same outcome for the second test and for my father's test results as well. Continuing to pray and forever grateful. I have put in so many prayer requests over the last few weeks and now have another one to add. This morning I woke up with swelling under my eye just above the cheek bone. It has not subsided. I pray that it has nothing to do with an underlying health condition. Praying that it looks better tomorrow and that it will go away and not return. I will watch for changes and if need be have it checked out this week. Thank you for answering past prayers. Dearest St. Jude! Heard about my father's test results and something was found but it is benign! He will have to be monitored every 6 months or so as a precaution. Thank you for answering my prayers! Still waiting on one more set of test results in regards to my mother. Praying that everything is okay and that all will be benign. Again, thank you! My mother is going to the doctor tomorrow for some of her test results. I am praying that all her nodules are benign and that no further follow-up is needed for this or for her other set of test results. Thank you for your intercession and for answering prayers in the past. I am always grateful. Thank you St. Jude for answering my prayers! Both my mother's test results were negative! The 3 moles I have been watching over the last couple of months are not getting better. In fact, I have noticed some slight changes in colour, size and shape. I pray that they are all benign. I continue to have the odd intermittent pain in my left breast/armpit area. I am praying that it is nothing serious when I have it checked out. To be honest, I am really hoping that it will go away on its own by then. Also, with everything going on in my life the last few years my marriage is suffering. Two night ago seemed like it was the last straw. I cannot let it get to that point again. It has happened far too many times. Praying that my husband and I make the changes necessary to make this marriage work for the sake of us and our special needs child. I thank you for your intercession and from the bottom of my heart, I thank you for answering past prayers. My sister is going for a medical test tomorrow that she has been putting off. I pray that all will go well and that nothing serious will show up considering what she went through last year. Thank you for answering my past prayers. I have made a doctor's appointment for this week to get a referral to a dermatologist to have a look at the 2 moles and 1 spot that I am concerned about. One of the moles has flattened out and became smaller but the other one seems to have changed in size, colour and shape, somewhat. The spot on my hand has also gotten slightly larger. I pray that in all instances, each case is benign and that I don't have to wait to long for the dermatologist appointment Please give me strength as I am so afraid. I have other issues in my life that need to be addressed but I am trying to deal with one thing at a time as it is all too much for me. Thank you for answering past prayers and for interceding on my behalf. I had my doctor's appointment and my doctor doesn't believe the moles to be of concern for now. One needs to be watched just it case it changes. I have to wait approximately 2 - 3 months before getting to see the dermatologist. Hopefully he will determine the same thing as my doctor. I thank you for giving me strength today and for the moles not being of a serious nature for now. I will continue to pray in regards to them until I see my dermatologist. In about a months time I will be having blood work, a pap, mammogram and breast ultrasound done. Praying that all my blood work is normal as I had slightly elevated cholesterol levels, that my pap is normal as I have a history of abnormal ones and that everything is benign with my breast issues. I have a new concern after my surgery in the opposite breast that is stressing me out. I will need much strength when it comes to all these tests and my breast issues. Thank you for answering past and current prayers. My sister is still waiting to hear about her 3 test results that she had done at the beginning of December. When she called to find out if they came in she was told the results were lost. Not sure if she had to redo the tests or if they were eventually found but she is going in either tomorrow or Tuesday to find out. I pray that everything is okay considering her past history. Thank for answering my prayers in the past and for intervening on my behalf. Forever devoted to you. Say this prayer 9 times a day for 9 days. On the 9th day your prayer will be answered. It has never failed. Publication must be promised. My sister got back her test results. There are two concerns and she needs to see a specialist regarding one issue. Praying that everything will be alright in both instances. Thank you for answering past prayers. Thanks be to God! Thank you St. Jude for interceding before God for me, so that I could get a new job. Thank you for your divine intersession. Thanks to God's help, I now have a better job and better work conditions. Thank you St. Jude for coming to my aid when I was desperate and needed your help. In your honor, I have made a contribution to the Children's Orphanage to give thanks to God and to you his servant and to help the Children in need. I just want to say thank you with all my heart and soul for your intercession. My suffering was about my rocky marriage . Me and my husband was convinced and depressed that our marriage was destined to end just because for the two years that we live together, we can only count on both hands the good things that have happened. We were talking about divorce and during this time I also flew back to my home country in the Philippines while he was in the States. I was so hopeless, hurt,depressed all this negative feeling you named it. I love my husband so much and left my home country just to be with him on that two years we were together. I do have my own career even before the marriage but this i gave up too just to start our life together. Moving forward to the results of my novena? It was insanely divine. One day he called me to say that i should take a rest because the next day I have to join millions of Filipinos who would take their chance to see Pope Francis as he make his way to his final mass on his recent visit here in the Philippines this 2015. He said that I should prepare well and will call me back after the mass whether he would start a legal separation or not. (We've been thinking about this for a month already while we were apart). At this point i was convinced that he will file for a legal separation and would not want to tell me until after the Pope's mass as to just not upset me. Believe it or not after the mass and i told him about it, he called me a day later. I was so nervous about this phone call and I gather all my might just to answer it knowing in my heart I entrust my beaten heart,our marriage and my faith to the Lord through the intercession of St. Jude, St. Rita for 9 times every hour the day before and once, the memorare to Mother Mary 9 times in a row. I answered the phone call and I can't barely speak as my husband overflows me with his words. He indeed prayed for some guidance while i was on the Pope's mass and told me that for some reason he can't explain, he suddenly had this great urge to continue our marriage and forget about the idea of legal separation despite of his strong reluctancy to reconcile . My husband isn't a catholic person nor a pious one, he rarely seeks God and rather trust his own ability for the most part so when this happened i was stunned and crying quietly as he spoke to me saying thank you on my mind to the saints, Mother Mary, Jesus and the Lord. This is my third day of my St Jude novena. Dear St. Jude I am in love with my most recent ex boyfriend. Please St. Jude I beg you from the depth of my heart to place me in his heart and help us resolve our issues and forgive each other. I beg you to intercede on my behalf that you show us how to communicate in a loving way. I cannot get this man out my heart as much as I try. Please St. Jude ask God for me to facilitate a reconciliation. Let our new relationship be centered on God. St. Jude he is a man that has been through a lot of hurt in his life. Please help him heal. Ask Jesus to heal him of the hurt from abuse. I care about this man deeply. He was one of my closest friends for years and I am despairing of the state we are in now. Thank you St. Jude for answering my prayers in the past regarding examinations. May the sacred heart of Jesus be adored, praised, loved, and preserved throughout the world, now and forever. Sacred Heart of Jesus, have mercy on us. St.Jude helper of the hopeless, pray for us. St. Jude maker of miracles, pray for us. Say this novena 9 times a day for 9 days and then publish it. It works every time. May the Sacred heart of Jesus be praised, adored, glorified, and adored throughout the world now and forever. Sacred Heart of Jesus, have mercy on us. St.Jude help of the hopeless, pray for us. St.Jude worker of miracles, pray for us. Say this novena 9 times a day for 9 days and then publish it. It works every time. Thank you St. Jude for prayers answered. please pray that things can start getting easier for my husband and I; I have been looking for a job, please help us that a good job opens up for me. I wanted to thank you for interceding on my behalf so that my prayers would be heard and answered. My doctor's office called to tell me that my second round of blood work came back normal this time for high blood sugar. I am relieved and grateful. Thank you! Nothing was said in regards to my pap test so the results must not have come in yet. I continue to pray that the results are normal. On Monday I go in for my breast ultrasound and mammogram. Praying with all my might for strength. I am so scared. I have been stressing about the pain I feel in my left breast for a number of months now. It started shortly after I had two benign lumps removed from my right breast last March. I pray that it is benign and that nothing of concern is found in either of the breasts. Please intercede on my behalf to God. I am forever grateful for past prayers that have been answered. Praying that everything will be okay with my three test results. I had my mammogram and breast ultrasound done two days ago. It was extremely stressful and I am praying that nothing will be of concern and all will be benign. Also, praying that my PAP will be normal. Please give me strength and peace. Thank you for answering past prayers. I am forever grateful for your intercession. My test results have come in and there is no concern of anything suspicious. I need to continue my one year follow-ups. I am so overwhelmed with emotion with this news. I sincerely thank you and God with all my heart for interceding on my behalf. Forever and always in your debt. Thank you! This Monday I have an appointment to see the dermatologist regarding some moles, spots and growths that I am concerned about. My family doctor informed me that one is pre-cancerous. I am praying that all the others have been caught in time and are benign. Also, just wanted to thank you for interceding on my behalf and in helping me get my past prayers answered. Eternally grateful. Shortly after I posted prayers for my upcoming appointment on Monday regarding the moles, spots, and growths that I am concerned about I found a hard lump in my private area. I will have to have this looked at as it came out of nowhere and I pray that it is benign and will go away on it's own. Praying again for your intervention. Thank you for answering past prayers. Thank you St. Jude for prayers answered! My dermatologist appointment went well! All the growths, spots and moles were benign! One was precancerous so the doctor burned it off. I am to keep an eye on it and if it returns then I need to go back in again. Forever grateful for your interception. My mother may possibly have skin cancer on her scalp. She is going to see the dermatologist/specialist a week from today. I pray that it's benign. If t isn't then I pray that it's only a precancerous lesion and that it was caught on time. Always grateful for your intercession. Thank you for answering past prayers. This Friday, my sister is going for her mammo/breast ultrasound follow-up as well as an internal ultrasound to monitor the tumor on her ovary. I pray that her breast results are clear and that the ovarian tumor is still benign and that it hasn't grown in size from 6 months ago. Also, praying that her blood work is all normal. Thanks you for interceding on my behalf and for answering prayers in the past. Always grateful. Please pray for me and my ex boyfriend Mike. He left me for his ex girlfriend. Please return him as my boyfriend to me very soon. He is the man of my dreams and I know that I was once part of his dreams. Please make him realize this. Please let him remember how much he cares and loves me. Please give him the courage to come back to me. I promise I will accept him Into my open arms. Forgive him for what he has done. I promise to love, obey, care for, and never harm him. He needs to be my boyfriend just as I need to be his girlfriend. Please pray and allow this to come true. May the Sacred Heart of Jesus be adored, loved, and glorified throughout the world, now and forever O Sacred Heart of Jesus, pray for us. St. Jude, worker of Miracles, Helper of the Helpless, please pray for us. THANK YOU St. Jude! My sister's follow-up test results came back clear! Always grateful for your intercession and help in answering my prayers! We have found a house which I think has been down to you but now our mortgage application has failed. Please help us find someone who will give us the mortgage we need so that we can provide a stable living environment for our children and ourselves. I ask with all my heart for you to find a way for us to get the mortgage and complete the sale. I know you know the lows I have had in the past year with my marriage and I give thanks to you that we are now on the right track but I would be eternally grateful for this so that we can move forward and have a happy home life for our young children. Thank You God and St Jude for interceding thus far! I trust you will continue to assist and provide as necessary. I pray that I will retrieve the finances owed to me to help make things easier. Also that my relationship will continue to grow positively in your way. Thank you my beloved St Jude for answering my prayers in times of need. I came to you once again and you were there for me and my family like you always have. I am eternally grateful to you for always being by our side - interceding for us, protecting us and listening to us. I remain faithful to you always. I know you will never forsake us. St Jude, patron of difficult cases, I promise to spread your faith and make your name known now and in years to come. Thank you. Thank you my beloved St Jude for answering my prayers in times of need. I came to you once again and you were there for me and my family like you always have been. I am eternally grateful to you for always being by our side - interceding for us, protecting us and listening to us. I remain faithful to you always. I know you will never forsake us. St Jude, patron of difficult cases, I promise to spread your faith and make your name known now and in years to come. Thank you. Saint Jude is no doubt our Miraculous Saint. God bless! This is my 9th day and I am publishing my request that she confess everything and that everyone sees her how she truly is and that he can feel my love. St. Jude, glorious apostle, faithful servant and friend of Jesus, the name of the traitor has caused you to be forgotten by many. But the Church honors and invokes you universally as the patron of difficult and desperate cases. Pray for me who am so miserable. Make use, I implore you, of that particular privilege accorded to you to bring visible and speedy help where help was almost despair of. Come to my assistance in this great need that I may receive the consolation and help of heaven in all my necessities, tribulations and sufferings, particularly - request - and that I may bless God with you and all the elect throughout all eternity. I promise you, O blessed St. Jude to be ever mindful of this great favor, and I will never cease to honor you as my special and powerful patron and do all in my power to encourage devotion to you Amen. St. Jude, pray for us and for all who honor you and invoke your aid. Thank you St. Jude for hearing my plea and thank you because I believe my prayers are beginning to be answered! Thank you St. Jude for hearing my prayers and I believe they are being answered. Saint Jude, glorious apostle, faithful servant and friend of Jesus, the name of the traitor has caused you to be forgotten by many. But the Church honors and invokes you universally as the patron of difficult and desperate cases. Pray for me who am so miserable. Make use, I implore you, of that particular privilege accorded to you to bring visible and speedy help where help was almost despaired of. Come to my assistance in the great need that I may receive the consolation and help of heaven in all my necessities, tribulations and sufferings, particularly, (please let her confess and everything and let everyone see her how she truly is and please let him feel my love) – and that I may bless God with you and all the elect throughout all eternity. I promise you, O blessed Saint Jude, to be ever mindful of this great favor, and I will never cease to honor you as my special and powerful patron and do all in my power to encourage devotion to you Amen. Saint Jude, pray for us and for all who honor you and invoke your aid. (Say the Our Father, Hail Mary, and the Glory be to the Father, 3 times). Thank you, thank you, thank you for answering my prayers!!! I had a message today to call my doctor's office regarding my test results. I was expecting the worst but the news was all good! No concerns only to come back next year for my regular follow-up. I am eternally grateful to you for always being there to intercede on my behalf. THANK YOU!!! My sister is going to have her mammogram and breast ultrasound before the end of May. I pray that her test results will all be clear and that there will be no malignant recurrences. Please intercede on my behalf. Always and sincerely grateful for having past prayers answered. My sister completely forgot about her breast ultrasound and mammogram appointment last week. She is waiting to reschedule both of them. In the meantime, she is going for a CT scan tomorrow to find out why she has been experiencing heart pain. Praying that all concerns will be ruled out and that everything will be okay. Thank you for answering past prayers. Forever grateful for your intercession. My sister is going to have her mammogram and breast ultrasound next week. She completely missed her appointment from last month. I pray that her test results will all be clear and that there will be no malignant recurrences. Please intercede on my behalf. Always and sincerely grateful for having past prayers answered. This novena to St. Jude worked for me again and so quickly. I am so thankful St. Jude for your continued blessings and miracles in my life. Jesus does listen and answers prayers. Thank you, I am a believer for life. I am on my 8th day of the novena. I continue to believe even as answers come that i dont agree with. Please help me to have faith St Jude, worker of miracles. Thank you God and St. Jude for helping us to reach our goals, I have not seen my prayer realized, but have faith it will soon come to pass. Thank you God and St. Jude that what we are praying and believing for will soon happen. Thank you God and St. Jude I am believing that my prayer will be answered soon.